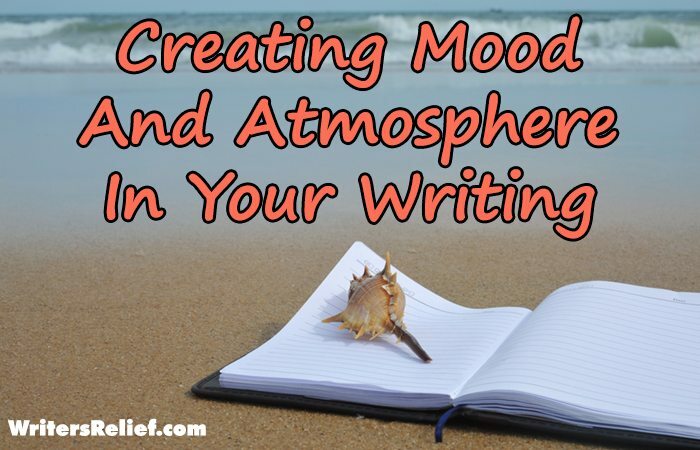 Creating Mood And Atmosphere In Your Writing - Writer's Relief, Inc. Many writers are able to create mood and atmosphere with little effort. But to become a better writer, you need a conscious, practical sense of the tools you can use to manipulate mood, atmosphere, and tone in your writing. Word choice. Your word choice is the number one tool at your disposal for setting the mood. Two writers looking at the exact same scene might approach it with different words (and therefore different tones). To understand what mood your word choice evokes, print a page and highlight key adjective and verbs. Are you creating a cohesive picture? Tone. Your tone is created by your word choice. Think of tone in the same way that you think of “tone of voice.” The tone you use, the words you speak, all contribute to the mood or atmosphere. Setting. You’re probably already aware that setting can affect mood: Is it a “dark and stormy night” or a bright, sunny day? The key to using setting to create mood is to pay attention to the way your characters interact with what’s going on around them. Are they challenged by the setting or comforted? Often this interaction enhances the mood. Dialogue. Lighthearted banter contributes to mood much differently than heated accusation. Of course, you can (and sometimes should) offer moments of levity in even the most serious conversation (or vice versa). But for the most part, be sure your dialogue supports the atmosphere you hope to create. Internal monologue. The same guidelines apply to a character’s internal monologue: As long as your character is consciously in tune with the atmosphere around him or her, you can use thoughts and observations to drive your scene’s mood home. Description. Description that stands apart from internal monologue can also contribute to mood. Your narrator—whether first person or omniscient—can affect mood by manipulating decisions about what to focus on and what to ignore. For example: focusing the narrative on a shattered porcelain baby doll on the sidewalk instead of the beautiful blue sky. Rhythm of language. The rhythm of your sentences will also affect mood. Short sentences will create a fast-paced feeling in prose, or a sense of solemnity in poetry. Long sentences full of commas can sometimes evoke a sense of breathless anxiety (commas force “breaths”). Well-balanced sentences can evoke calm and introspection. And you can change the mood by manipulating the rhythms of your sentences—by slowing readers down or speeding them up. Tools of poetry. You can use the tools of imagery, metaphor, simile, and other poetic devices to foster a particular mood. For example: The sunset was like a bloodstained mattress conjures a much different image than The sunset was like a rose silk scarf. Mood should shift from the beginning of a scene to the end of it. Unless you’re writing in a slice-of-life style, the “rules” of creative writing often suggest that a character should change in some way over the course of a scene. When a character experiences change, allowing the mood to also change makes the shift more powerful. In longer works, mood should shift from scene to scene. If every single scene in a longer work has the same mood, readers’ eyes will glaze over. Be sure there’s discernible difference in mood between one scene and the other. Consider how mood will affect readers’ emotions as your story progresses. The mood of a passage can/should affect or support the main action. Whether you’re writing a poem or a story, the mood of your passage can challenge your characters/speakers; make them question themselves; or affirm their choices. A rainstorm on a bride’s wedding day can cause her to rethink her marriage; a rainbow can support her choice. And while mood can reflect a character’s feelings, it doesn’t necessarily have to—imagine a scene in which a very happy woman who has just received the best news of her life is about to be kidnapped; she’s so happy, she’s missing the foreboding, eerie mood of the world around her. Mood should be describable. If readers can’t say, “this feels gloomy” or “this feels lighthearted,” then you may need to do some work to create a more memorable passage. QUESTION: Do you consciously pay attention to the mood that you’re creating as a writer? Or is it just something that happens? Excellent information here about creating mood in writing. Thank you! I’ve shared this on social media. The article was very informative. I have been writing for many years, but I have never paid specific attention to the setting of the mood. I thought it simply happened just like that. Thank you.